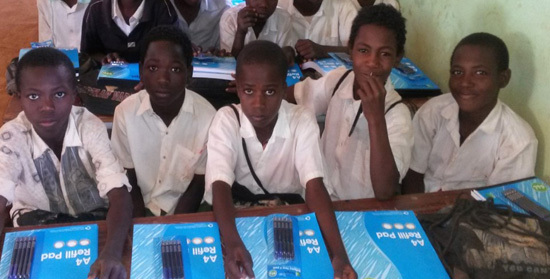 BOSS began an initiative to send surplus stationery products from the office products industry including notebooks, pens, pencils, text books and other educational items to children in Africa to improve their learning. Having previously worked with Comic Relief and the African Education Trust, a partnership is now in place with the Catholic aid agency, CAFOD, who successfully distributed a shipment of items to hundreds of children across Southern Sudan in January 2015. The Federation are preparing to send another shipment in 2016 and are appealing for donations of product. The cost of shipment for each container to Khartoum is £1,500 and the onward cost of distribution per container in Sudan is £3,200. We need your help to gather the product and the funds to get these items to the children who need it most. Sponsorship of any size will go a long way to help pay for the shipment of the remaining containers. Thanks go to all companies who've supported the scheme so far and to Robert Baldrey of EVO, Chris Collinson of Superstat, Philip Beer of Hamelin and Kiran Mistry of COLOP who have generously offered sponsorship to cover some of the shipment costs. Please contact BOSS CEO, Phil Lawson, at [email protected] if you can make any contribution, whether product/financial, to this fantastic cause. It will make a huge difference to the lives of children in Southern Sudan.